Come 2nd of April and you would be sitting for your JEE Main exams. With so much at stake and the competition ever growing, it always helps if you have figured out the way to give your best. 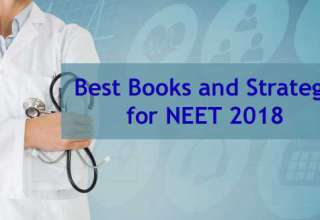 A vital step in preparation for this coveted entrance examination has always been to review the question set, topics and the weights for each topic that have been placed in the previous years. It is helpful if you go through a section-wise analysis of past papers and the marking schemed that were entertained previously. In 2016, more than 12 lakh candidates sat for the exam and this year, we expect even more. 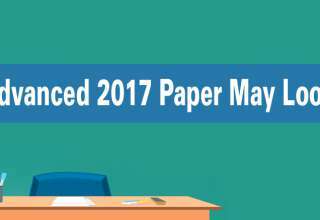 2016 JEE examinations saw 90 questions in Paper 1 divided into three equal sections for Physics, Chemistry and Mathematics. 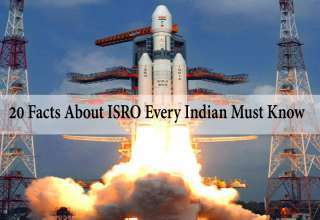 The questions came from the CBSE prescribed JEE main syllabus and overall, it was a ‘moderately difficult’ exam to crack. It is also important to remember that each of the 90 questions would be carrying 4 marks each and incorrect answers received a -1 marking. 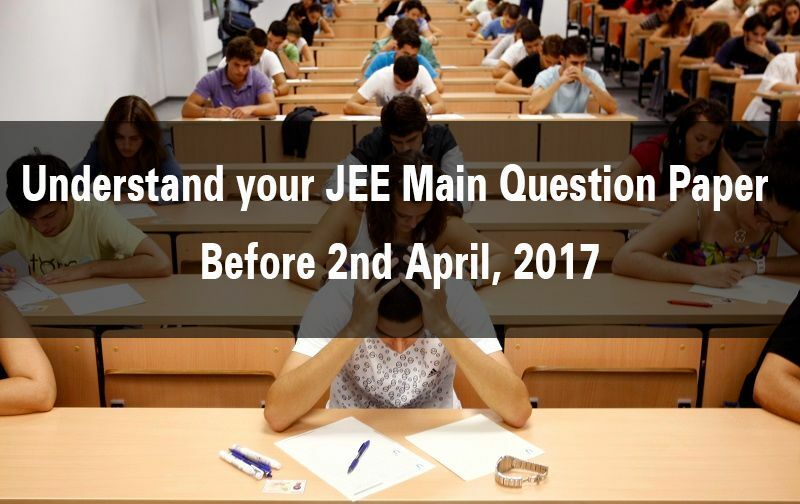 The JEE 2017 examination catalog suggests that candidates need to get a really good score to hope for a seat in the JEE Advanced selection process. From the 12+ lakh candidates from across the country appearing for the examination this year, about 2,20,000 would be eligible for the JEE Advanced. In the 2016 examinations, the question set was properly balanced but the focus was on analytical skills and conceptual problems. Lastly, the questions from the Chemistry section was a bit fluctuating but doable. 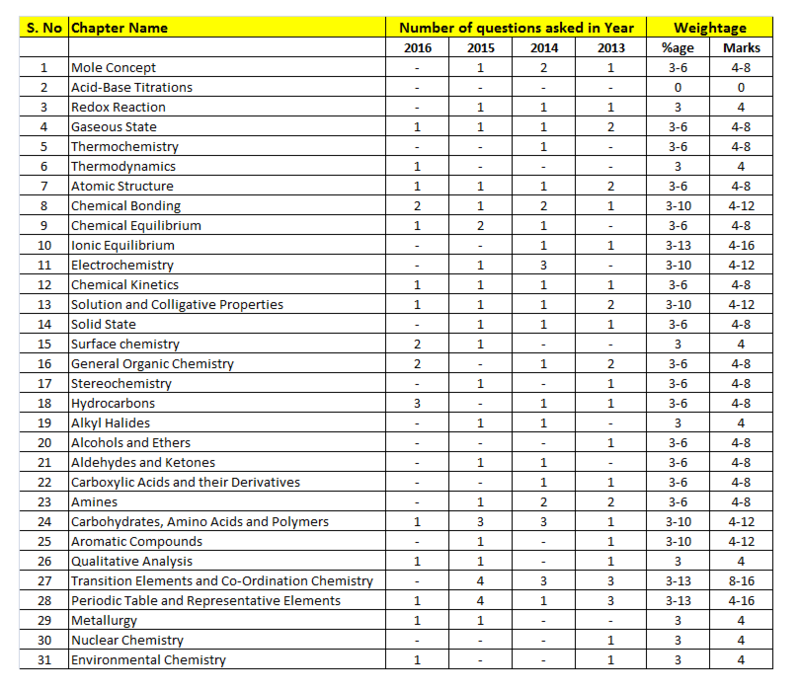 In fact, Chemistry seemed to be the easiest of all sections in 2016, excluding some really tricky questions. 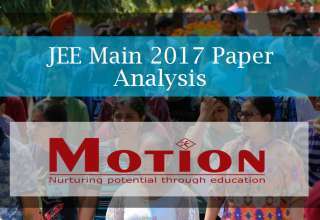 The JEE Paper II 2016 which aims at B. Arch. admissions however was of a different setting. The ‘Mathematics’ section to be the toughest with 80 questions coming from the Math & General Ability. Further, students had to answer a minimum of one question from a set of three in the drawing section. The Mathematics section also consisted of 30 questions with each carrying 4 marks and with 4 choices to choose from. There was a penalty of 1 for an incorrect answer. Since, this called for a lot of calculations; the Mathematics section also took the maximum time (race against time phrase meaning) to answer. In total, a candidate will have to answer questions weighing 120 marks. 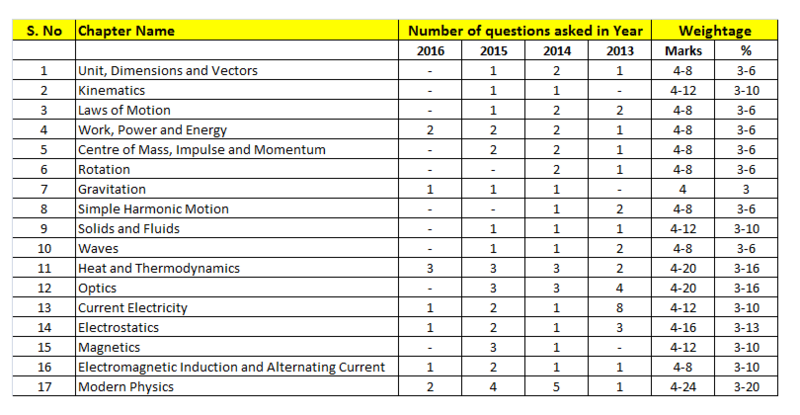 Between 2013 and 2014, the number of questions deemed difficult increased significantly but there was no huge change in the 2015 set. The good news is that it’s quite possible that there would be a decrement in the negative marking this year. The Mathematics section for 2015 JEE was however reported to be too difficult with 50% of the questions marked ‘highly challenging’. Only 27% of the questions were easy to answer for someone who is thorough with the topics. Mathematics: Integrals, Trigonometry, Probability, 3D Geometry, Vector Algebra, Straight Lines, Conic Sections, Matrices & Determinants and Sets Relations & Functions. The above are the chapters you should put a lot of focus on. 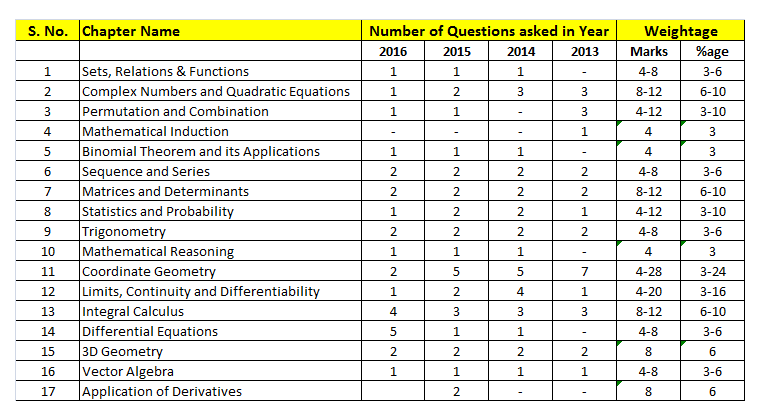 However, questions will also be coming from Limits & Continuity, Derivatives, Quadratic Equations, Permutation & Combination, Circles, Binomial Theorem, Complex Numbers, Sequence & Series, Differential Equations, Inverse Trigonometry, Application of Derivatives, Heights & Distances, Statistics, Mathematical Reasoning, Application of Integrals and Mathematical Induction. Chemistry: Organic Compounds Containing Oxygen, Chemical Kinetics, Equilibrium, s-block Elements, d & f block Elements, Basic Concepts of Organic Chemistry, Chemical Bonding & Molecular Structure, p-block Elements, Chemical Thermodynamics and Coordination Compounds are the most important topics to be covered this year. 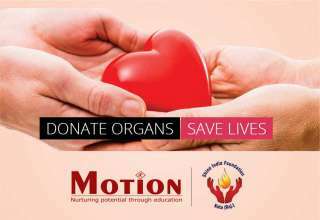 Physics: The chapters to focus on would be Rotational Motion, Oscillations & Waves, Electrostatics, Current Electricity, Atoms & Nuclei, Magnetic Effects of Current & Magnetism and Laws of Motion. Other important topics are Kinematics, Work Energy and Power, Thermodynamics, Optics, Properties of Solids & Liquids, Electronic Devices and Electromagnetic Waves. There have been no significant changes in the exam pattern previously and we don’t expect it to happen this time either. 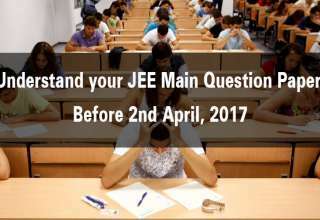 Even if it happens, you would be informed through the JEE official website. There could also be a cutting down of the cut-off marks as the number of aspirants for JEE is continuously dwindling. Be also aware that the difficulty level of each subject too would be variable, as has happened over the years. Overall, if you are properly prepared, you would have a fair chance in getting selected for the Advanced JEE exams. 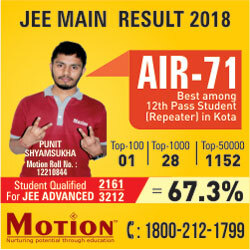 Your best bet would be taking a consultation with reputed coaching institute in Kota. We wish you all the best in your future aspirations.